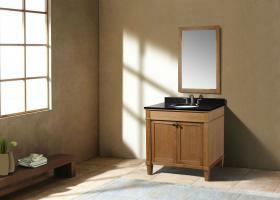 The sleek modern design of this single sink vanity will make a very handsome addition to the bathroom. 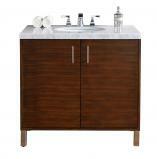 The American walnut finish shows off the natural beauty of the wood grain. This look is nicely accented by the chrome finish of the hardware pulls and the legs at the base that raise the piece off the floor. The double door cabinet opens up on soft close hinges onto a very nice sized storage space that also includes a shelf for organizing bathroom essentials. 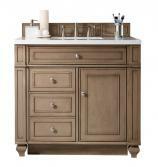 This piece will go well with many types of room décor and will look great for many years of use.